Welcome to the September 2010 edition of ACE NorCal News! On August 20th, 2010 the four Santa Cruz Beach Boardwalk legends Charles Canfield, Ted Whiting III, Carl Arnett, and Carl Henn visited Playland-Not-at-the-Beach. This very unique event was open to all ACE members who wanted to come and meet these special people. My family and I arrived at Playland-Not-at-the-Beach at around 10:00 AM. Within the next hour or so, many other ACE members arrived to help set up for the legends arriving shortly. At 11:15 AM, the four legends arrived at the front of the Museum to much excitement. They were taken down the hall of memories where they reminisced about Playland-at-the-Beach. Next, the legends were taken into the “Laffing Sal Theatre” to watch some historical films about Playland-at-the-Beach. Once the movies were through, Charlie Moran (The creator/building of the Playland model in the theater) showed the legends his beautiful model of Playland that is displayed in the theater. The lights in the room were dimmed down for full effect. After that, it was about time for lunch, so they all headed towards the kitchen area to eat. There were about 15-plus ACE members that showed up to meet and eat with the legends. We ate pizza for lunch along with cupcakes for dessert. I saw next to Charles Canfield at lunch and got to ask him many questions I had wanted to ask him for a long time. After lunch, the legends moseyed on over to the Fascination Parlor, to play a rousing game of Fascination. The four legends went head-to-head-to-head-to-head, and in the end, Charles Canfield won! Once they finished playing Fascination, Richard took them through the rest of the museum, including Circus World, Charles Dickens, Santa’s Village, and Dark Mystery. The legends also played a few games of pinball throughout the day. Before I knew it, the day was coming to a close. Just as they were about to leave, they surprised the museum with a donation. The Santa Cruz Beach Boardwalk donated an old Ferris wheel seat that they took off of the Ferris wheel last winter. We were amazed and very excited! A HUGE special thanks goes to the Santa Cruz Beach Boardwalk for visiting Playland-Not-at-the-Beach. Also, thanks for the generous donation of the Ferris wheel car to the museum. Thank you, SCBB, for keeping the Santa Cruz Beach Boardwalk operating for over 100 years and congratulations on your success and good luck in the future. For those who haven’t been to the Boardwalk recently, be sure to check out the NEW Haunted Castle! 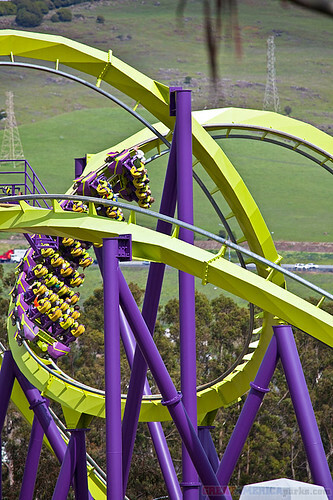 California’s Great America is open weekends and Labor Day Monday in September. For hours, see: http://cagreatamerica.com/visit/visit_calendar.cfm Enjoy a fireworks display at 9:45 PM on Sunday, September 5th. You and your family can visit this beautiful park with its six gardens and world famous Circus Trees. Get a special back-to-school admission ticket for only $12.00 per person. You, your families and friends can visit the park for more than 70% OFF the regular admission price! 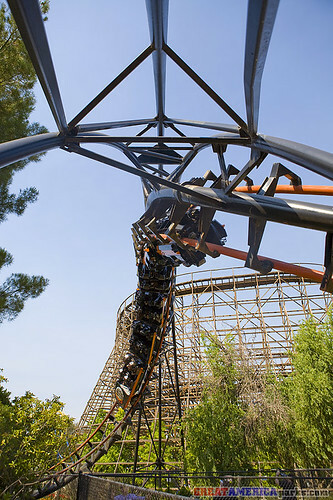 Simply click onto this link http://www.gilroygardens.org/schoolspecial.html Print your coupon and bring to the park. 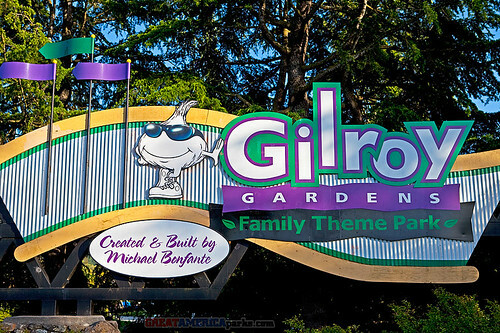 — Thanks go to Emi Pearce for the Gilroy Gardens weekend special offer coupon. 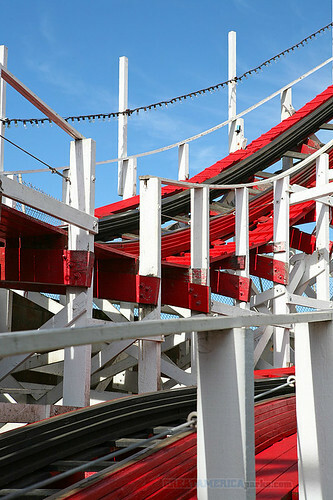 September 4,5,& 6 – Playland Lives On Forever! Bay Area residents know that September 4, 1972 was the final day of operation for Whitney’s Playland at the Beach in San Francisco. Within weeks we lost the Fun House, Laughing Sal, the roller coasters, the games, the excitement, and all that fun. Fortunately Playland will live on forever in our hearts and in our Playland-Not-at-the-Beach Museum of Fun, as you will discover this 3-day weekend. We are bringing back the good old days! We will be conducting behind-the-scenes tours showing how volunteers built every section of this museum. We will be showing how it all came together — opening our archives for guests to look through our photographs and memorabilia. We will also be showing off the three new exhibit areas that are currently under development — you will be the first people to see them. There will be special contests for everyone. Bring the kids and the grandkids too. We’re all indoors so the heat outside won’t matter. Come have a grand time! You are also welcome to bring a picnic lunch. We provide the eating areas (indoors) as well as refrigerator, ovens, ice makers, range, and microwave ovens. Saturday at 1:15 and 3:00: Professor B’s Flea Circus! + Fifi LaFlea, the Parisian high wire walker — will she make it all the way across? + The Daredevil High Diver, Evil Fleanevil, fearlessly climbs to the top of the ladder and then plunges head first into a small pool of water! + The world’s only Mind-Reading Flea, the amazing Fleo! + A flea fired out of a cannon to be caught in the hand of a member of the audience! Never to be forgotten! The Austrian strong flea, Arnold! + A flea-powered carousel entirely propelled by the strength of two amazing fleas! There are skeptics out there who claim there is no such thing as a Flea Circus. See for yourself or, better yet, bring a camera to prove to your friends that everything is as described. Sunday and Monday: Amazing Magicians performing both afternoons! At Playland-Not-at-the-Beach pay one low price to play all day — over 30+ pinball machines set on Free Play, Penny Arcade devices, carnival games, magic shows, historic films. Only $10 for youths (up to 14 years old), $10 for seniors (55 and up), and $15 for General Admission. Parking is free! If you wish to visit one of the local eateries for lunch, re-entry to the Museum of Fun is free. Special on Monday, Labor Day, September 6th: Adults get in for the child’s price — $10. Just print out this coupon and bring it with you. Without this coupon the price is $15. Put on your helmet and pull out your bullwhip. Become Indy Jones or Dora the Explorer as you try to solve our mysteries. We supply the treasure maps, the compasses, and all the tools to discover the hidden treasures. Beware the Chamber of Laughter and don’t get fooled by Esmeralda the Foolish Fortune Teller. She’s just trying to get you lost! These adventures are geared for every age from 5 to 105. We are proud to announce in early October The Return of Heather Rogers providing two evenings of Magic Classes — Beginning and Advanced. Watch for details on our website and in future newsletters. Don’t miss our Extra Day to PLAY This Weekend! This weekend is Labor Day Weekend, and Playland-Not-at-the-Beach will be open for all three days — Saturday, Sunday & Monday, September 4,5,6 from 10 AM to 5 PM. “Remembering Playland”, the documentary all about Whitney’s Playland in San Francisco, continues to play at 12:30 each day at the Balboa Theater. Or you can order it on Remembering Playland DVD from our Playland Souvenir Shop. Just go to our website www.playland-not-at-the-beach.org or call (510) 232-4264 ext. 24. The DVD version has fifteen minutes of extra footage not shown in the theater. — Thanks go to Frank Biafore for contributing this article. September 2nd is the last Pepsi Night of the season. An empty Pepsi can will entitle you to purchase an unlimited rides wrist band for $9.95 plus tax.